The artisan that requires the removable bowl spiral mixer, finds an irreplaceable support for his work in all ISES line of dough processing equipment. The range of ISES line of spiral dough mixers permits to exploit the advantages of the removable bowl trolley which allows the easy and safe transfer of large quantities of dough to give efficient management during processing, when adding ingredients and when leaving dough to rise. All removable bowl mixers type ISES have two bowl rotation speeds, and two spiral mixing speeds, operating independently of each other, and the option of reversing bowl rotation. Recently introduced second bowl rotation speed offers expert artisan a wide range of dough processing options. ISES reversible bowl motor direction allows foe homogeneous and refined processing even of small quantities of dough. The mixer type ISES together with line of our lifter-dumpers, and additional bowls carrying trolleys contribute to greater optimisation of work, and improved efficiency. Years of experience in this sector of the market have contributed to development and ongoing improvements, of very reliable equipment, with well tested solutions, and high quality components. 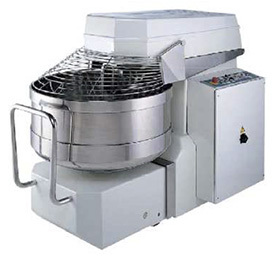 The ISES line of dough spiral mixers proved to be high quality equipment, delivering excellent results in various condition, and reduced dough temperature. As results of over 20 years of experience in this sector, this is definitely the best mixer for medium sized artisan bakeries. A complete range of options to suit specific requirements is available. Temperature probe, computerised management of recipes storage, reinforced motors, mixing spirals for special products, stainless steel version, micro ingredients insertion tanks, CO2 injection system, etc, etc., to name just few, but more options are available.